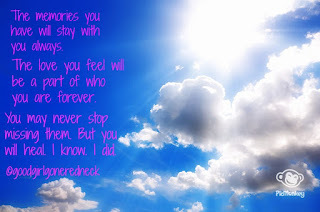 Good Girl Gone Redneck: Reflections. This year I skipped my annual January 17th post. I don't know what it was, exactly, that led me to skip it, but I did re-read all of my previous posts for that date of years past. January 17th is a day of loss for me. For my family. Many years ago my grandmother passed away. It is a memory I won't likely forget for the rest of my life. It left me aching and raw. She was my last living grandparent. I cried. I hurt. I felt pain to my core. I think a part of me knew she had suffered for so long and that she wouldn't hang on forever. But there was always hope. Always the belief that she knew us. Knew we were there. Her eyes showed as much. Her voice, gone for so long. But deep within. Herself. Myself. We connected. We knew. Losing her hurt. A lot. Tore out a piece of me and tucked it away. I remembered losing my other grandparents, but I was an adult now. It was somehow different. Her grasp, intentional. Strong. Powerful. I felt a similar one many years later when I met my husband's grandmother. I took to her instantly. Something in the hold - the hands - the way they expressed so much with so few words. The grandmotherly way, perhaps. Years later, after my grandmother's passing - we faced loss again. My family. Confused. How was it possible? Two grief-filled Januarys? The same date? The same date. My cousin's husband was two weeks older than I was. It never made a stitch of sense that he could be taken from us. He was a cop, so we expected violence, danger, things like that. But in an instant something inside took him away. Lost. Life gone. I shake my head all these years later. I miss him, still. I turned 40 this October. He would have, too. He should have. Shouldn't he? Of course. We understand loss of the elderly. We do not accept it, necessarily, but we accept that it is likely and when it happens there is this small thing inside of us that knows it is the norm. The circle of life. But to lose someone your own age? So young. So full of life and health and strength? It cuts to the core. Makes no sense. Hurts. A lot. So every year I reflect back. On the moments I learned of these losses. On the way my heart reacted. My body. My whole being. But I live. I live on because of them and in spite of losing them. Because I have to. Don't we all? And so, another January slowly goes by and I tuck them back into a part of my heart where I carry them always. It's definitely harder to lose a younger person but no matter the age, it just plain hurts. I'm so sorry that day is particularly tied to loss. Oh, Andrea. We're typing through tears here. That was absolutely beautiful. Your love for them just shines out. We're so sorry for your loss. I am sorry for your losses. The loss of a loved one is the hardest thing there is. Hugs and love to you. So sorry for your losses, Andrea. It's unimaginable to lose two people on the same day. Hugs, momma. So sorry for your losses. It is so difficult to deal with. I often think about my grandmother. But you honored them both with such a lovely post. So sorry for your loss Andrea. When we are grown, I think that we feel each loss more deeply. We understand how precious life truly is, since we have lost that invincibility of youth. *hugs* I'm so sorry, that's incredibly rough.